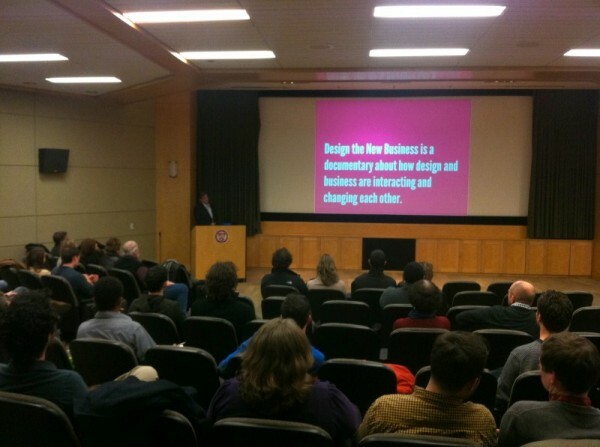 On January 5th, the Philadelphia Chapter of the Industrial Designers Society of America (IDSA) kicked-off the year with the long-anticipated US premiere of “Design the New Business” at Philadelphia University. Here to present and discuss the making of the documentary was Erik van Bergen, one of the six designers who helped create the film. Overall, the event was a tremendous success and we had a great turnout. Close to 50 designers, engineers, small business owners and students were in attendance and eager to see the film. At every IDSA Philly event, it’s important to provide our members with the sense they learned something new from the experience. I had an opportunity to interview many who attended and everyone felt the basis of documentary, merging both business practices with design thinking, had a positive influence on them. Many felt that listening to the different points of views, from so many established professionals all focusing on the need for design thinking in an increasingly changing and competitive marketplace, was extremely relevant to their own situations. As for myself, I was excited and inspired to learn more on the subject of design thinking and to consider how I can put it into practice. I’d like to thank Erik van Bergen for taking the time to present this documentary to IDSA Philly. I’d also like to thank Philadelphia University who hosted the event. In keeping with some of the insights from the documentary, the school’s College of Design, Engineering and Commerce features an integrated curriculum among the different disciplines to help prepare students for real-world innovation in multidisciplinary teams. Soon Philadelphia University will also launch a new graduate program called a “Strategic Design Executive MBA.” This program aims to prepare a new generation of innovative professionals and leaders who integrate both business and design thinking in practice. This entry was posted on Monday, February 27th, 2012 at 1:21 pm. It is filed under Experiences, discussions and opinions. You can follow any responses to this entry through the RSS 2.0 feed.